Please note: An expanded version of this story, which includes interviews with people who lived in the Silver Street house, is in our book Haunted Marion, Ohio. It was just an idle question, something to make the time go faster at work. I had been telling my coworkers about how my nephew and I were kicking around the idea of starting a web site devoted to Marion’s more macabre side. “I know one,” said my coworker Fawn. 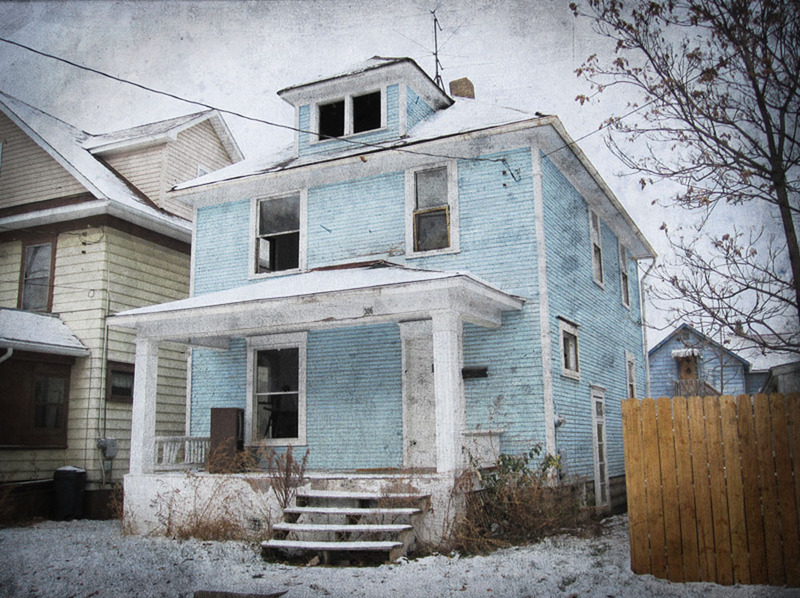 “My brother lives next to a supposedly haunted house on Silver Street.” Since I had grown up on Silver, I was immediately interested in her story. The house in question in December of 2010. I eventually tracked down the story and found that Fawn was basically right. However, as I read through the brutal facts of what had happened, I began to see this as more than just a spook story based on rumors and half-truths. This was a story of real evil. According to the October 11th, 1995, edition of The Marion Star, Wayne Thomas, a man with a history of domestic violence, murdered his girlfriend, Mary Welcome, and her nine-year-old son, Christopher Hook. Police speculated that, “Thomas…beat Welcome’s head against the baseboard in the downstairs living room, pinned her to the floor and strangled her. He continued upstairs and cut Christopher’s throat with a butcher knife.” Thomas took the easy way out by shooting himself up with a massive dose of insulin. Unfortunately, Mary’s father, Charles Hook, made the horrific discovery on Saturday, October 7th, 1995. He had gone over to the house because he had not heard from his daughter for a few days and had grown worried. Rightly so. The three had arrived in Marion only six weeks prior and were renting the house, located at 306 Silver Street, from Mr. Hook. Seth and I pulled up across from the house. It was just another run-down house in the run-down end of town. My old neighborhood. We snapped a few photos, our mood somber. A few windows were indeed missing. I don’t know how they ended up broken out, but I suppose it didn’t matter. Far more important things had been broken in that house. I lived in this house in 1999!! It is haunted! Never had any windows break though. I lived here. Well, my grandma did. Some things happened. They hurt us and would not let us leave. My Aunt Sara told the boy Christopher to go to the light, and he lifted her bed up and wrapped the alarm clock cord around her head. How many times did you say you watched The Exorcist? I used to babysit for a family after this happened, and we were watching tv and saw a little boy on the stairs. So true! Someone later down on the comments said this house isn’t there anymore. It is still there. I went by there today and it looks like someone’s living there. It was still there last time I was on Silver Street. One of my best buds lives near it. OMG! I lived here!! It is Haunted. No windows ever broke but some crazy things happened in that house!! I lived in that house in 2001-2002. Spooky things! Are you taking an volunteers for investigations? I have great computer skills- hardware, software, video analysis and video editting. I am, however, skeptical about the supernatural, although I remain open-minded. I would love the chance to investigate a property with alleged spectral occupation with professionals. I remember this happened. It is all a true story. My grandma lived down the street from the girl. She told me the girl was very kind and had a good mom. My grandmother was also friends with the girl’s dad. My uncle was in his teens and when they found out what happened, they were horrified. I lived in this house. OMG we saw a man with a flannel jacket roaming the house. We heard stuff in the basement, too. I was pregnant and I was walking down to the basement to do laundry and someone pushed me down the stairs. There was an iron board which was stuck on the wall (neither me nor my ex-husaband could get this iron board off the wall when we moved in), and it came tumbling down on me. I also got a nail through my foot. Then one night my friend stayed over. She started screaming and said there was a man breathing heavy on her. Then one time me and my ex were sitting watching TV when we heard a drill just start – freaked us out. Once we had a party with lots of people there and the door leading to the kitchen from the hallway and the door leading to kitchen from dining room kept slamming. Yeah it’s very haunted, and I was glad to move. I go by the house a lot and I’m glad to be away from it. So much happened there – I would’ve never stayed there alone. I had two kids at the time, and they down cleaning the basement at like 6 a.m. When I asked them why, they told me it was because “he wanted us to.” Really freaky. Is this really true?? I ask this because the man in that house was my father, and I am interested in knowing more! Sean, I lived in that house as well. I will most deff say it is HAUNTED. The things that happened in that house was crazy. I also have seen the man on the flannel jacket. Sean, this is true, and if you would like to help investigate it you can. I am sure there would be a way to let you go. This house is very haunted. I cannot breathe in the attic at all. My dad, step-mom and little sisters lived in this house, and they have all seen and heard things in this house. I was standing out on the porch one day with my sons, and someone I did not know walked up and told me the whole story on this house and what had happened. Like I said, if you would like to go, there might be a possibility that I could talk to some people who have investigated and are still investigating this house. Yes, I’d love to investigate this house! Right now we’re investigating the old YMCA! My mom, Kathy Thomas, runs our SHOO, Supernatural Hunters of Ohio. And would would love to go in and get some proof! I would like to know more, to help put a close to this horrific story. Often times there is no closure for the spirits of an event this horrific. It leaves a psychic scar on the location that frequently continues to manifest even after the location is torn down and gone. I have lived in this town most of my life and I know for a fact no one stays in that house very long. I lived just a few houses down from this family. I knew the family. They were all very nice. To this day I don’t believe that Wayne had anything to do with this. This is my personal opinion. Do u know who owns the house so I may contact them to do a investigation? Chrissy, I am Mary’s daughter. It is my personal opinion he did do it. He took my mother, my older brother and unborn sibling from myself and my brother. Drugs make people do crazy things. I just drove past this house with no windows at the top. Strange. A car out back with headlights on freaked me out. I wonder how it felt to live in it… Spooky things happen these days. Barb Elder, could you please answer my question? Were all of the sightings that you saw males or an entire family? Because what I heard is that he killed his wife and kids and then himself. I only saw the man. My daughter who was 1 at the time played peek-a-boo with the “little boy” as she called him. I heard there was a bad drug deal and they were running from some bad people. The bad people got in the house and tortured the family, killed them all and made it look like the dad did it. Wayne wasn’t Christopher’s father. He was the father to the unborn child. And my mother may have been into drugs but she would never cause a problem for herself or children like that. That was my husband, Wayne Thomas. I have the complete police report, and I spoke to homicide detectives as well. Their story changed over three times in one day. I am not defending anyone, but no one really knows exactly what horrific thing happened in that home. Our other 9-year-old son was supposed to have moved out there with him, but I did not allow Mary near my child. She also left two other small children behind in Massachusetts. I was married to Wayne for 18 years but then we just grew apart. We had four children and he was not abusive. He was hard working and an excellent father. Something else went down and it is being kept quiet for whatever reasons. Don’t believe everything you hear or read. Wow….I dont know what really happened. Never said I did. Just know what I saw and heard while living there. No I completely believe all of you. It just gives me, like, wicked chills. The reports from the police and then the homicide detectives changed 3 times. I wish I knew the truth. Mary was my mother. I am one of the children who stayed with my father in MA and am grateful that I did. My mother was a kind woman. She had her troubles as does everyone else. I have heard the story of my grandfather who found them, but I am not here to tell the story. I am just here to say that this article is useless and there is no such thing as a haunted house. Just an unfortunate situation. Mary was my cousin. She was a very kind woman willing to help anyone. Jessica, she talked about her girly all of the time. I am truly sorry for what happened to your Mom and brother. I remember very vaguely years ago. I know you would probably find this irrelevant but felt like I needed to say it. It has haunted me internally for many years as to why and how this happened. Also I dont ever remember your Mom abusing my brothers at all. Just thought you should know..
Sean thank you. Angela hopefully karma serves you well with the lies you tell. Angela, Mary did not leave myself and my brother behind. My father had custody of us because he sobered up. And thank god. Had she taken us with her, we would’ve perished along with them. By the hand of your ex husband. Don’t talk about things you don’t know. Nor bad mouth my mother. Barb….WOW!! I’m so glad that I’m not the only one those kinds of things happened to. I used to see the man on the stairway A LOT!! My daughter, who was 1 at the time, played peek-a-boo with a boy in the house. Mya, I saw the man quite a bit and my daughter saw the young boy. The man killed his wife or girlfriend – not sure if they were married – then killed the young boy and himself. That house is crazy haunted!! They were not married. I was his wife at the time. We separated 2 years before that but were still married. We separated in 1993. I survived 4 years before we got married and 12 more years after that. This deeply saddens me. Christopher was like a step-brother to our 4 sons. They were close. This has left an impact on many lives. To Alicia, I am his oldest son and I actually got his bike and had for many yrs. I couldnt get out there at the time for various reasons. Just an fyi. Angela here you don’t mention the abuse. You say how you loved my brother like your own? This may be a haunted house website and open for stories and lies but the least you could do is keep your “facts” straight. I spent probably all of five minutes in this house as a skeptic and ran out a believer. My cousin Sarah used to live there. Her mom is the one interviewed in the book. So we got curious. I am doing investigations for a possible TV show. So if ANYONE who lived in the house that would like me to hear their story for the show or just give me some background, that would be GREATLY appreciated. And I cant locate the owner, so if anyone knows who might own it, that would be great too. You could locate the owner if you get on the Marion County Auditors website and search the address. It should give all the contact information. Just a suggestion. Good luck! Finding this article has been extremely upsetting for me. I was friends with Christopher in 1st grade, when we both lived in Massachusetts. I was devastated when he moved away. I remember my mom coming into my bedroom when I was nine to gently tell me that Chris had died. I had hoped for a long time that she had misheard the newscast, but I didn’t try doing an internet search until tonight. Chris was a very sweet, fun boy, and what Wayne Thomas did to him and his mother was cruel and horrific. Your loss is shared. I miss him too. I wouldn’t say “run down side of town” for whoever wrote this. Some people nowadays can’t keep up with their bills, let alone the homes. Anyway, when all of this happened, I was living at 241 Silver in a small apartment. I remember when this all unfolded and the police blocking everything off. We stood there stunned as they went through the house and investigated this. It is a very, very sad story. I remember the people seemed like they had just moved in like a month prior to this, which made it really weird. Back then in that part of Silver, there were always people fighting, couples fighting in the street and loud parties. It was a pain just to live there in that section. So if there was yelling and screaming, people didn’t pay much attention since it was a nightly thing anyways. I was pregnant and stayed up almost all night every night because it was so loud. But if you want to know who owns the house, call the taxation department – they will know. I lived in this house when I was 8 years old. It is haunted. And I can still remember a bunch of things about that house. My mother would have the channels flip randomly on TV; she’d say, “Mary stop!” and it’d stopped. You could hear a kid playing at night, and my mom would think one of us was up. But we would be dead asleep in Christopher’s old room. My toys were where Thomas died, and I used to get the creepiest feelings. The house is super creepy, and so many weird things happened there. I’m very glad I don’t live there anymore. I owned the house from 1981 until I sold it in 1995. It was never haunted during the time I owned it so if it is now it is because of what happened there in 1995. It just recently sold again this past week with a bunch of other foreclosures. Not sure who bought all of them. You could check with the tax department. Yeah, like you would actually admit to selling a home you knew was haunted to people! You wouldn’t because you never would’ve had any buyers. Was just looking at this website. I have no information to add but find it creepy because my husband’s name is Christopher Hook. An our son’s name is Christopher Hook II. 🙂 Thinking about purchasing your book. Your site is awesome. Yeah, that has to be pretty creepy, Brooke! I’m glad you like the site. You can buy the book from my aunt up at Rocky’s bike shop. I really would like to know more of this house on Silver Street. I work with a guy who’s trying to buy this house. Many coworkers have told him not to, but he doesn’t believe in ghosts. Personally I have no stories but know somebody who lived there and who told me all I need to know. Same things have been mentioned above. Being pushed down stairs, window problems, toys without batteries turning on. He better start believing, huh. I lived in that house for two years. Weird stuff happened all the time. I will never go back in that house. I didn’t know about what happened until after we moved in. Then random people would walk by and tell us what happened. They said it was haunted. At first, I thought they were kidding. But after a few months things started to happen. The doors started to open by themselves. I heard a young child a few times. I use to go in the basement to do laundry. I saw things out of the corner of my eye, but I always ignored them. I’ve seen things like candles and dishes fly across the room. Then a few times I heard a man in my room telling me to wake, but my dad worked nights. I’ve seen a Bible fly off of a shelf and the lights go out. I have seen things in that house I can not explain. My sister’s bed floated in the same bedroom where that window is missing. I’ve also been pushed down the stairs. I woke up a few times with scratches on me. I heard crying late at night. TVs would turn on and off by themselves. If I was there alone, I’d hear someone walking around upstairs. I honestly believe that house is haunted. I wish luck to anyone who buys that house or goes into it. I also lived in this house!!! The first day I went to sleep in my brand new home, I heard noises coming from the bathroom, so I got a random lamp from the night stand because I was really scared that this thing might be dangerous and attack me…so I waited a little longer to see if I was just imagining things. The noise calmed down, so I just went back to bed. Around 2-3 hours later, I heard something fall and break from the kitchen. So I really freaked out! I decided to call my dad to come and see what the noise was, and when he got there, he entered through the back door which seemed to be hard to open. It would also make a lot of noise to try to open that door up. When my dad finally got in the house, he found broken plates and glass cups on the floor, and he started to shout out, “Hey, I have a gun! Come out!” Suddenly he felt a strong wind go past him, and then the lights started flicking off and on! I was really scared, so I decided to call the police. When the police got there, everything was normal and the shards of plates and cups were all picked up and not a single piece of glass was left behind. The first day in that house was also my last. I couldn’t stand being there alone with all these weird things going on. I’m at work reading all of these comments and I have goose bumps! Super creepy! How many people lived in this house after the murder….? I too am trying to buy this house. I got a decent counter offer from the man who owns it now. I am a firm believer! I have made an appointment to see the house just to investigate. However, I want to get in deeper. Can anyone help me and we can set something up? I wanna be there at night. And I too have seen the man in the flannel. I believe I’ve caught him on my camera twice – from the side window on the left part of the house and in the front living room window also. We used to live across from this house back in 2004/2005. My son at the time was 6 years old. We would always sit on the front porch and relax and talk. My son on more than one occasion told me and my boyfriend at the time that he did NOT want to play with the little boy across the street. When we would ask what little boy he would say the one he can see through. We had to move my son’s bedroom to the back of our house because he was scared of the windows in the front of our house because he could see the little boy across the street in the bluw house waving him over to play. It was quite weird, yet saddening. I live 2 streets down, and many people say that it’s haunted. There is a family that is living there now and has been for a few months. Maybe you should speak to them about the house. While my experience is not directly related to this house, I have had experiences at a different house on Cherry St. A friend of mine used to live in a house there that his family still owns. At one time it was a duplex, and when I’d go over, we would always hang out upstairs in what would’ve been the living room up there. Because of this, the downstairs was always dark. I went every weekend for years to hang out there. Many times when I’d walk down the stairs to leave, just as I’d get to the front door, I’d get this feeling somebody was staring at me, and a couple times I turned around to look for myself. I never mentioned this to him, though. A few months after I noticed this we were hanging out and the subject of hauntings came up. I mentioned my experiences there, and another guy who was always there said he had the exact same thing happen to him. Our friend who lived there just matter-of-factly said, “Oh that was just Grandma”. The part of the house we felt it coming from was the kitchen, and he said she was always in there cooking. He also said he woke up many nights and could see her standing in the doorway of his bedroom. As stated earlier, while this isn’t directly related to this house on Cherry, it is a different house on the same street. In regards to the house this article was written about, I’d be interested to know which house on Cherry it is and would love to go and investigate that as well as the old “Y”. My daughter was friends with Christopher when they were 8 and 9. She said he was her boyfriend. I have seen a lot of different families living in that house but never for very long. There are no ghosts!!! Its all made up so you buy the book by the creators of this website. Truth is they will delete this posting and dont have the balls to contact me.. The facts are sad and shouldnt be twisted to make money…. Dear Sean, I have no idea whether the house in question is really haunted. I’ve never been in it. The facts of the case – Wayne Thomas murdered his wife and step-son – are well documented in the Marion Star and other newspapers from that time. Wayne Thomas was your dad, wasn’t he? I’m very sorry things turned out the way they did for everyone, including you and the rest of your family he left behind. You’re right – it’s a terribly sad story. And I would be lying if I said having this story on this website didn’t make me a little uncomfortable. But at least here in Marion, the house is well-known as the site of those murders, and of course such a dramatic event has led to a lot of stories floating around town. The Criswell/Holycross family lived in that house from 2008 to 2010, and they say the house was haunted. They were very believable and had nothing to gain by telling me about their experiences in the house. And while I do make money from the book sales, believe me, I’m not going to retire to the Bahamas any time soon. More than anything, I published the story because it’s part of the fabric of Marion. And while it’s not a happy story, that doesn’t mean it’s not worth saving. If you’d like to share the Wayne Thomas you knew and what led him to such a sad end, please feel free to write to me. I’d be happy to publish what you have to say. And here you go again seeing the freaking money signs! Smh get over yourself woman. You was his “wife” but had not been together in how long? You make me sick! In 1995 my first child was only a few weeks old when this happened. One evening I looked out of our living room window to see police cars and ambulances at that house. It was three doors down and across the street from where we lived at the time. The police were there for hours that evening. It wasn’t until the next morning that we heard what happened. My heart shattered for the mom and her son. Yes. The man had issues with beating up his girlfriend. Took her life and her innocent son’s life then his own like a coward would do. I have no clue why anyone would want to live in that house. It is a resting place now for a mother and her son. So very sad. Sean and anybody else who denies existence of hauntings: I used to be just like you and did not believe in ghosts or spirits. Furthermore, I did not believe a haunted anything was possible. That all changed when I began visiting my cousins in their home on North Burgess, located on the west side of Columbus, Ohio. There were many occurrences in that house that opened my eyes and mind and I realized that it is real and it is a scary thing to experience. During one of my mid-day visits, my cousin was arguing with her ex boyfriend. They just kept going at each other. Out of nowhere, a cup that was on a table clear on the other side of the room (with nobody near it) flew across the room and hit the wall on the other side. This is just one of the many experiences I had. My brother was washing dishes one night. He turned to get dishes from the stove. Thank God he was alert because when he turned around there was a steak knife balancing from the very back tip of the handle on the edge of the counter. Nobody could have done that. Nobody could have gotten in there in that little time to even attempt it. I totally get that you do not believe, but sometimes it is better to believe and be prepared than to be sorry. That house changed my whole perspective on such a topic and, after while, I had enough of it and refused to go back. Eventually she moved because incidents became worse and started involving the kids. When she got her new home, the kids and her were content. It was as if a heavy weight had lifted. Recently, however, she’s been experiencing more paranormal incidents. I believe her, and I truly believe that whatever was in the house on Burgess followed and has decided to start acting out. Wake up because this is real…just as real as the good Lord. Our minds often deny such topics because it is scary to even think about. But I know that eventually you will have an experience that will wake you up. I am confident in that. God bless and many prayers. You’re 100% correct Trisha. There are ghosts – I have witnessed many myself. Delete this post huh??? I think it’s still here. Yes he was my father, and she was his girlfriend as he never divorced my stepmom.. The facts are probably true as I dont see how this could have happened any other way. I dont know what really happened in that house on that night maybe I dont want to believe what is speculated. Im not saying that he did or didnt but everyone has there breaking point. Growing up as a child and teenager there are certainly no memories of EVIL, as this story states and have great memories that I wish could have continued into adult hood, but thats life. Did he have a temper? Yes. As to what have lead someone to take it that far has haunted me for 18 yrs, I have no idea, maybe something is missing, and no matter how bad a relationship gets, going that far there is no excuse but like I said who really knows? There wasnt much of an investigation. He did have 4 other children back home in Ma. as I am the oldest, 19 at the time and now 37. But growing up he certainly wasnt the abusive parent like his other half. As for ghosts I just dont believe that sort of thing as I have never seen anything. Maybe he is still there? Thanks for the reply.. I have been in the house also, and it’s definitely haunted — there is no doubt in my mind. We did audio recordings and we believe we got Christopher Hook on audio saying “mommy,” “help me” and other things. We went up into the attic and experienced a massive cold spot and also got a huge “growl” on audio on our way down from the attic. We heard knocking on walls and floors throughout the house and a child crying. I still have the audio if you’re interested. There is no doubt in my mind this place is beyond haunted. Even though your father wasn’t an evil man, he died a violent death as did Mary and Christopher. Evil spirits can be created by good people who were robbed of their life and trapped where they took their last breath. That’s enough to make anyone angry even after death. I just responded to his comment as well. In the house I spoke of in that comment we also captured two different voices in the same recording. We were trying to get my 2 year old cousin to lighten up and stop being grouchy and the phone usually worked for that. Well… his mother said, “James! Say hi!”. He said no. At the same time he said no, we could hear a child’s voice say, “Hi, hi, hi.” Almost in an echo. Toward the end of the recording, we heard a deep male voice sort of whisper, “Get out of here you dirty whore.” I was just amazed at how clear the voices were! I still have it to this day. I’d love to know more about this house and hope that people are being 100% truthful with their experiences. It’s not cool to lie or exaggerate the truth. I was related to Mary and Chris. Is there any way you can send me the audio? I went to school with Chris, the son. We were In the same class. I remember when they came to tell us he passed away. I use to walk by there all the time. We would put flowers down. BELIEVER, I would love to hear it! Any way to send it to me? I will post more as to why I would love to hear it tomorrow. Has anyone contacted professional paranormal investigators? Would be a very interesting house for their television show. They should’ve contacted Zak Bagans from Ghost Adventures. My niece lived there right after that happened. She said that she would see a guy standing at that top of the stairs. I was told that the lady was about to have a baby too, and he cut the baby out of her. My mom lived 2 houses down from that house. WE LIVED ACROSS THE STREET. AND YES MY HUSBAND SAW PEOPLE IN THE UPSTAIRS WINDOW BUT NO ONE LIVED THERE AT THE TIME. WE COULD HEAR SOMEONE YELLING FOR HELP LATE AT NIGHT. WE DID NOT KNOW ANYTHING ABOUT THAT HOUSE.. MY COUSIN CAME OVER THEN TOLD ME ABOUT WHAT HAPPENED THERE. SO I ASKED MY GRANDMA (SHE IS 76 AND HAS LIVED ON AVONDALE HER WHOLE LIFE), AND SHE SAID THAT HOUSE HAS WAS HAUNTED YEARS BEFORE THAT EVER HAPPENED.. SAID WITCHCRAFT WAS DONE IN THAT HOUSE AND OTHER HOUSES IN MARION. SHE SAID THERE WAS A TIME WHEN PEOPLE WERE GETTING INTO WITCHCRAFT AND OUIJA BOARDS. PEOPLE THOUGHT IT WAS A NEW FAD. I’m wondering if the house didn’t already have an evil entity and somehow was able to to latch onto him. From the sound of it, everything by was normal til they moved in there. heard a lot about this house since I bought the house next to it in the picture, but i have not seen or heard anything happen there, and the guy who lives in it now hasn’t said anything about strange things happening there since he moved in last summer. This is all new to me! Never knew any of this and it’s a shock to me cuz I’ve walked passed many run down houses, but with this one there was always something in the back of my mind. I just get a weird feeling every time I walk by. It’s just unexplainable. But I’ve just always felt, I don’t know, strange every time. So I knew Chris. I lived in the old salon on the corner. When they first moved in, they seemed normal enough. She was a bit odd and he seemed friendly. Chris and I played together a lot. He was always scared of the basement. The last week or so they lived there, it got real weird. Chris wasn’t allowed to play much if the man was home, and I didn’t knock on the door to ask because he would get into trouble. As for the flannel, Wayne always wore a flannel shirt. And the little boy waving out the window kind of warms my heart because that was our code. If Wayne was at work or asleep, Chris would wave me over from the upstairs windows because his mom wouldn’t just let him come over – I had to go there first. I had never heard that. Fawn is my cousin, and the house her brother lives in was ours. It has been owned by my family since the 80s, I believe. Where was the parlor? I feel almost like the parlor was the duplex on the corner of Oak almost on Silver? I lived in a house on Oak in the 200 block in 1988 that was haunted in the same manner. We came home once to find a guy at the bottom of our stairs bloody and with blood running down the wall right in the corner where the phone was! My bus stop was by this house from around ’98 to ’01, and I went to school with people who knew the kid. I always remember a teddy bear in the front room and hardly anyone lived thee for more than a month or more it seemed. I’ll help with the investigation if anyone wants to start a group. Sounds interesting. Actually there are a few haunted places in Marion. @ Gloria he did not cut the baby out of her. I lived on Silver St. at the time also, and no, he did NOT cut the baby out of her! I know they couldn’t keep people in there after the murders. Most people know that in homes where horrific acts of violence have happened, the homes can keep the energy from the crimes and acts of violence!! That will always be there until the home is torn down. I hope they get rid of that energy before it’s torn down!! And yes he did wear flannel shirts! Just an FYI, in case no one knew. If a murder did in fact take place there, any realtor for the home MUST disclose this in the state of Ohio. I know this because my parents have been looking at homes and one of my mom’s biggest things is to not buy a home where anyone has died or been murdered, as she and I are a firm believers in ghosts. Had anyone tried talking to any real estate agents? I found this out after I bought the house on West Mark St. Apparently a man killed his girlfriend on my porch and shot himself in my living room. However, I was never told this happened by the realtor, so after a Google Search I found the article of the murder/suicide and still was not informed until after I asked the realtor. They said they assumed I knew and offered my money back, but I had already sold my other house. I think everyone should do their own research on houses before you sign any papers. Hi Eloise. Have you read this story? http://www.spookymarion.com/?p=856 It mentions the Mark Street murder/suicide. My mother that was killed in your house. Her name was Kimberly Howell, and John Elliott was the pos who killed her and then himself. I was a few houses down on Mark Street at my aunt’s housevthe day it happened. I couldn’t believe that they were arguing outside, and then just that fast he did that awful act!! Right! I read in a comment that a previous owner rejected the accusations of it being haunted prior to the murders and suicide. Of course, realtors are all about that money so yeah they will neglect any fact of it being haunted for the sake of their pockets! Shame, shame! They were real people with loved ones and family that still are haunted by the violent acts everyday. It saddens me to see people continue to disregard the feelings of the loved ones affected by wanting to get a thrill. I truly feel for the family that has to continue to re-live this terrible story. May god bless all involved. Is this all for real? I have a cousin that does paranormal investigations. He would love to check out the house. Is anybody living there now? I’ve always heard the house was haunted. I was walking by the house one evening with a friend and said to him, “this house is supposed to be haunted.” As soon as I said this, something in that house (possibly a window frame) crashed down and made an unbelievably loud noise. I tell you that really spooked me out. That definitely made me a believer. I grew up two houses to the left of this one. My brother and I were friends with Chris. Wayne was a nice guy, and I still don’t believe he did it. I haven’t been in the house since the night before the murder, but I remember my brother and I begging our mom to let Chris stay the night. She said it was a school night. To this day, it bothers her that she said no. My oldest sister was pregnant at the same time as Mary, so our families became quick, close friends in the short time they lived on Silver. I remember when we left that night, my other older sister and I BOTH saw a man in a long black coat, black cowboy hat with a cane walk onto their porch. He didn’t even look at us but it scared me. I was only 7, but my sister was 15 and we both agree that man was evil incarnate. My family and I still think of them often and miss them dearly. My dad lives on Chestnut and when we stop by there, we always hear something out where there is a broken window. It creeps me out bad. I will always have nightmares. They tore this place down awhile back, I’m pretty sure. No, the house is still standing. I went to school with Chris. It was crazy when the teachers came and told us that he passed away. After reading all these comments, I have become more interested in this house and would like to investigate it myself. I’ve have plenty of experience in dealing with the paranormal since I was a child. I’ve seen and heard just about everything that all of you have described in all of your posts. None of it scares me cause I spent most of my childhood in fear because I grew up in a haunted house. So if there is any way that anyone here knows anyone who could help so I could get into the house to investigate at night, I would be thankful. After living there and having all kinds of crazy things happen, Id love to go back in and see what I can see or hear!! Who owns the house now? No idea who owns the house now. I’ve been trying to find out out but no leads on that yet. Just put the address in at the auditor’s office under real estate search if you want to know who owns that house! My kid’s dad was friends with Chris Hook… He told me this tragic story and pointed the house out to me and said it was now haunted! I don’t know, though – never been in it! We have lived in the house on Silver St for 3 years and it’s not haunted. The house is not haunted. I’ve lived in the house for 2 years. There is no ghost, so it’s not haunted. This is not true. It is not haunted. There are 4 kids and 2 adults living in this house. My sis is Kathleen and we have lived here for 5 years. I grew up down on Silver and Rose Ave. The house has sat empty more than lived in. I would walk to school by that house for years. And let me say, it’s very spooky. I’ve always heard it was haunted. I believe in that kinda thing. I believe it’s all true!! Rhonda I also lived in the house on the corner of Sliver St and Rose. Is your dad’s name Gary? I believe our dads were friends and so were we. That does not seem like it was so long ago. I remember it very, very well. I remember the news teams from Columbus flying overhead. It all did happen. Man, it was so sad. But ghosts? NO!!!! The only paranormal are evil spirits. That is something you don’t want to mess with. When we die the spirit goes back to the maker, and He decides after that. Seems like a lot of people have lived in that house since the murders. If you add them all up, I don’t think it adds up. I was thinking the same thing. How can so many people have lived in the same house since the murder? Is everyone talking about the same house? I live next door and have lived here since 2005. I have personally seen over a dozen families move in and move right back out, most of them lasted maybe 3 – 6 months. The shortest stay we saw was a very very large Mexican family. They packed up and moved out after about 2 weeks. Half of the people I talked to who lived there claimed it was haunted. Lots of TVs glow green when off. I believe in the paranormal but that isn’t it. Stop talking about it. It is not haunted! I find it funny that a few people are pushing so hard to get people to stop talking about it being haunted. I have personally been in this house. My cousin is one of the Holycross family members that resided in the house until 2010. After hearing her stories, I decided to take a team in myself in 2012. “Believer”was one of these team members. We have audio evidence of occurrences in that house. (I’ll honestly have to search hard for it if someone wants to hear it.) We recorded a growl and a child saying “Listen to me” and “Mommy”. We were on the first floor and felt and heard people knock on the floor boards under our feet. We went down to the basement and found no one. I mean you could FEEL the vibrations from knuckles hitting the floorboards under our feet. We thought the owner had sent someone to mess with us. Hearing foot steps and knocking so loud upstairs above our heads that we thought someone was messing with us and yelled up the stairs that we were investigating the house and that they were trespassing. We went upstairs to find no one again. This was all during the day. I stepped in the house only once at night for all of 15 minutes, and then our equipment died and the footsteps started. One of our crew members almost had a panic attack because she felt that the house was preying on us. She said we had to leave. Now. So we did. And we never went back. There is no doubt in my mind that this house is haunted. There is something evil in that house and I don’t think it is any of the people that sadly passed away there. If you find the audio from that night, feel free to send it to us. We’ll be more than happy to put it on the Spooky Marion site. Since then the crew I went in with has dispersed, so I will have to see of I can find the audio. I beleive the growl is on YouTube somewhere, but I couldn’t tell you where, lol. I will let you know if I locate it! The story about these murders is true. I went to school with the boy. I just put a new roof and siding on this house last summer. Hannah you have made yourself no longer credible for commenting on this matter seeing as how you don’t have any idea how long you’ve supposedly lived there. Let me tell you, that house is haunted!! I dont necessarily believe Wayne nor Mary had a clue about the negative energy in that house. It preys on people. Did it make someone crazy? Could have! Other houses have been known to perpetuate evil. Take for instance the Amnityville House. As far as witchcraft, yes! There were houses in Marion where seances were performed. I used to walk Silver St. on my way uptown from the Hub to Whiteys. I have passed that house many times. I saw that little boy in the window, waving and because the house was dark, I screamed up are you okay? I thought he got in there and couldn’t get out. The next thing I knew, he was gone. So I went to the door and knocked, but no one was living in that house. And I have to tell you it was quite unnerving. I called the cops from Whiteys. But, when they got to the bar, they said no one was in the house or living in there. I never walked past that house again! It wasn’t until years later, I came across this website, and said to myself, Hey I know that house! People might live there and maybe things don’t go bump in the night now. But you couldn’t pay me to live in that house! I would like to know where this house is located. At the beginning of the comments. Address is 306 Silver Street. I knew several of my family members were murdered, but I did not know it was this house. RIP to my family members. Hey man, I’ve got a real ghost hunting crew if you wanna help investigate. You are crazy if you don’t think it’s haunted. I know what I saw and I know what I felt. I’m not crazy. I know that house has a presence in it. Whether it’s good or evil, I don’t know, but I do know there is something in there. I see you will not post my statements! Well, this is my family, my cousins who were murdered! There are no ghosts – it’s all in your head. Get a life. They’re dead, and that is the way it is. You insult us with all these ghost stories! You are all simple-minded people. Now post this! I would really like to go back in the house. When my ex came to Galion where I was living before and told me we were moving to Marion, my first words were, “Please tell me it’s not the blue house on Silver Street.” He just looked at me. All we ever saw was the man in the flannel shirt. I remember the day I moved in, I went and cleaned out the rocking chair and all the little knick-knacks and pictures and the dirty purple rug he had in the back room in the basement. I wanted to get it all out before the trash ran. Well, the next morning my two girls were in the basement cleaning, and when I went down there, everything was back in that room. There was a big wall cabinet in the kitchen, and the doors would swing open when someone was in living room watching TV. The attic just had a table with an ashtray and a couple of wooden chairs. I decided to go clean it one day. I wanted to put the kids’ old clothes and stuff up there. Wasn’t long before I was taking everything I had put up there back down again. It was way too hot to keep anything up there. I was afraid a fire would start. I would actually love to go back in this house and see what I feel since I’m a lot older . How do you put a pic on here? Yeah, I lived there and when me and my family moved in, we fixed the windows and two days later three windows were broken and there was no one around to break them. My sister, her husband and 3 kids lived in that house shortly after the murders. I believe the house is haunted. They experienced strange things. My sister could elaborate more than I can. I lived in a house on Superior St that was haunted. It got so bad that we literally ended up moving out in the middle of the night. My daughter was only 4 at the time and she seemed to be the one that was most affected by the house. She was always scared of the mirror in the bathroom and would talk about the old lady who was in the mirror. She would wake up screaming in the middle of the night, she would go from lying down to standing straight up in her bed in an unnatural way. I have had so many things happen there that it makes it hard for me to talk about. You have to also remember that behind Superior St is a cemetery. If anyone wants to know more about my experience, then they can find me on Facebook. I live next to the house and can confirm that Hannah and Kathleen both live there. I think it’s been close to 3 years now, maybe a little longer. We are good friends with the family and I’ve been in the house several times. Same with both of my brothers. My two nieces and nephew have stayed over there several times over the last few years. I can’t confirm or deny what happened in 95, but I can say that there is nothing to investigate. Please do not bother them. They’ve got enough to deal with and they don’t have the time to be bothered by any of this. Thank you. I remember walking past this house heading to my bus stop and to a friend’s house. In the early morning, I felt like someone was watching me and I would look over, but there was no one there. Then one night I was almost out past curfew, so I was running home and again I felt like I was being watched from that house. I saw a boy watching me from the window upstairs and a man in a flannel coat leaning against the post on the porch. Lived there for two years. Literally nothing happened. Most people claiming hauntings are just looking for attention. A family DOES live there currently. This was the first house I sold as a realtor in 2013. A father and his 2 children bought and live in the house. It’s amazing how many people have lived in this house. I was born in Marion and have seen a bunch of abandoned houses and factories. I used to live in this one house and there was a house down the street and our neighbor told me there was a murder there. I believe it there has been many murders in Marion. This house is for sale right now for $15,000. They also have a few pictures posted. I read about this house years ago. Then today I saw it for sale in FB. It immediately gave me chills! So I googled it and yep same house. I remember when this happened. I was 10, maybe. My mom used to work at the Leader Grill. My mom told me about the lady Mary and her son who would walk down and eat. She said they were very quiet but she was a sweet lady. I remember my mom telling me what happened. I remember walking to the restaurant after school, and I went up on the porch. The house just makes you feel uneasy. Guess you all never thought a site like this would negatively affect her surviving children. I am Mary Welcome’s daughter. Her story and your gross words of “hauntings” do not belong here. It’s offensive.